Need a little more twitter-savvy? Use these quick tips and have fun! Save hashtags you like. I save them for offline events and tweetchats so I can go back and review the discussions I like. Think of it as building your own transcript. Build lists so you can target specific tweeters, and make sure you have lists for local tweeps, tweeps in your industry, and target clients tostart. Lists will make a big difference as your following and timeline grow. You already know to get rid of that egg pic. Use a human picture, not a logo. Logos can’t tweet and we want to know who we’re talking to. Make sure it looks like you. Suppose we cross paths? I want to recognize you. Use your location in your bio. You’ll be found when people perform searches more often. Complete your bio – otherwise you’ll look like spam. Make it keyword rich too. Again, people perform searches to find interesting people to follow. Can you make sure your bio somewhat relates to what you tweet about? Tweet in 120 characters and you’ll increase your chance of being retweeted. You’re leaving room for a person to retweet and/or include a comment. Some people just tweet sales pitches, and we don’t like it. So don’t do it. Engagement is the name of the game. Don’t go backwards in your timeline. For the most part it’s a waste of time. Want to know why? Read my previous post on this. Don’t automatically #followback people simply because they’re following you. Not a good strategy if you’re on here to engage for business. Find people with whom you would like to engage, be proactive. Tweet at different times of the day to increase your visibility. Consider the fact that we’re all in different time zones, regions and countries. If this is problematic for you, consider scheduling tweets throughout the day. If you follow me on Twitter @MissKemya, you know I occasionally tweet #TwitterTips. 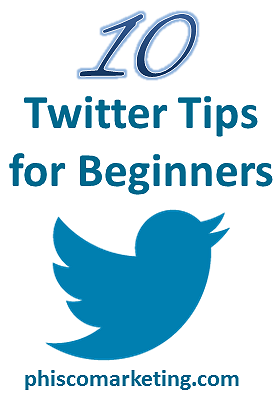 I figured I’d make it easy on us and compile this list of #TwitterTips for beginners. Do you have any #TwitterTips to share? Comment and let me know! Phisco Marketing: Twitter Is For Right Now - Not Yesterday! 🙂 Thanks for the tip, I have a habit of going backward in my timeline. Excellent, glad to share knowledge! Once I learned this tip I enjoyed twitter much more. You’re quite welcome! Thanks for commenting, and I hope you put these tips to good use!